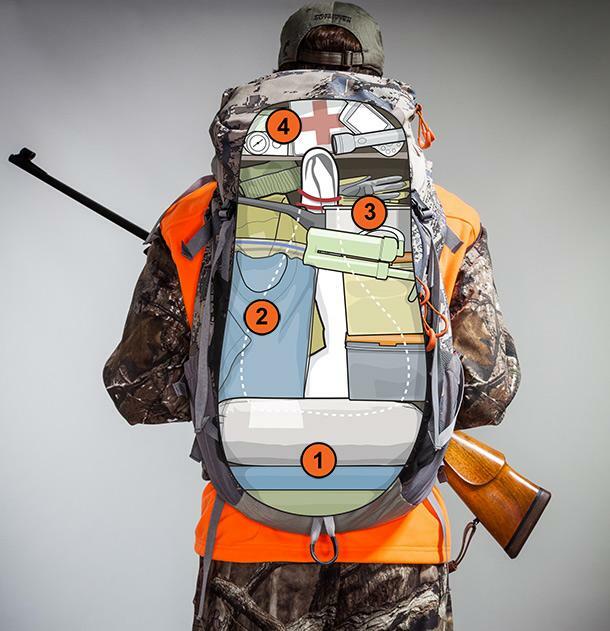 In hurry and trying to hastily pack out a deer from the backcountry in one trip, a hunter carried a heavy, irregular pack too low and in the process damaged a spinal disc, pinched nerves in his hip, and lost feeling in his ham hocks for quite some time. Here are a few tips to help you shoulder a heavy load comfortably and safely—and avoid the physical therapy and chiropractic sessions the hunter had to go through. Stuff your sleeping bag, pad, and tent in the bottom of the pack. Place the heavy freight—like a meat quarter—above the light cargo and against your back. It should sit above your hips and between your shoulder blades. Surround the heavy stuff with lighter gear, such as clothing and food, followed by cooking gear, water filter, and the like. Pack the lightest gear like a hat and gloves in any remaining space at the top. Stash gear like a GPS, flashlight, or other items you might need to access quickly in the pack’s lid. 1. Lift the backpack up onto your shoulders. Next, pull down on the shoulder adjustment tags to lift the pack and draw the load closer to your upper back. 2. Secure the belt and cinch the slack so it cups the top of your hip bones. Fastening the belt too high constricts your stomach; too low limits leg movement. 3. Pull down the load-lifters. Once you cinch these, the straps should be in contact with your shoulders—but with less weight on your shoulders and collarbone.